The Bermuda Triangle has been a mystery since forever and to be honest I would never travel in that region. 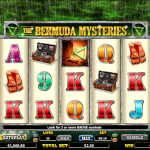 But I think I will take my chances with The Bermuda Mysteries, the latest video slot game from NextGen Gaming. With this game you will go on a hunt for everything valuable that has been lost and grab it for yourself. Well, that does not sound so bad. There are a couple of features and symbols in The Bermuda Mysteries that are worth mentioning here. The wild symbol is the pilot and it lands on the second, third and the fourth reel. Its function is to stand in for every other symbol except for the two scatters to complete a winning line. The main feature is the free spins round and it is activated with the golden badge symbol. You need to land at least 3 symbols to receive 12 free spins. 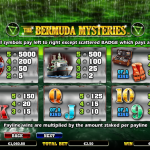 During the feature, green radar is added to the fifth reel and every time it lands the multiplier will increase by x1. The map symbol activates the Rescue Bonus, a mini game where you have to pick from locations to reveal prizes. 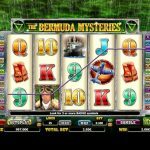 The Bermuda Mysteries is an intense video slot game. NextGen Gaming created this atmospheric game with sound effects that bring the whole situation to life and when you play you really feel like you are a part of it. The game play is straightforward and fun and there are a number of features that will make your experience worthwhile and profitable as well. We really enjoyed playing The Bermuda Mysteries, and we believe that you will too. And trust us you are safe, as long as you are sitting in front of your computer or mobile device. For another great engaging game you should consider playing Thai Sunrise a 5 reel slot by NextGen.